Vegetarian barbecue cooking can be a challenge but these fire roasted red peppers really hit the spot, the taste is lip-smackingly sweet and they’re really easy to do. You’ll see below that this recipe doesn't follow normal barbecue cooking rules in that I’m not too worried about flames burning the peppers so it’s something that can be done first on the BBQ while the coals are still settling down. 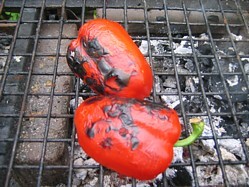 The idea is to char the skin of the pepper until is black and blistered. It doesn’t sound that tasty does it? Well you’re in for a surprise! The inner flesh will soften to a beautifully sweet melt in the mouth flavour. Have you ever wondered how you can buy peppers that are really sweet? Well the answer is in peeling off the skin because the sweetness is all in the flesh, That's why cooked peppers taste sweeter than raw and that's why this recipe is so good because we take the skin off altogether. 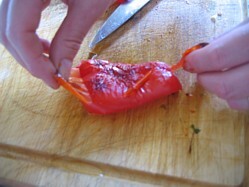 Cut the peppers into thirds length-ways, removing the core and seeds so that you've got relatively flat pieces. 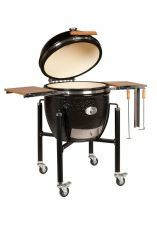 Place them skin side down on the BBQ grill for about 20 minutes until the skin is black and blistered. Turn them over cook for a further 5 minutes to allow them to fully soften. When well blistered, remove the peppers from the grill and throw them into the plastic bag, seal the bag and put to one side to cool. It’s great doing this on a social occasion because your guests will really wonder what in heavens name you’re doing! The steam generated inside the bag will soften the peppers and make them easy to peel. 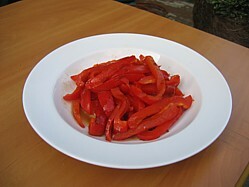 When cool to the touch, take the peppers out of the bag and peel off the charred skin, cut them into strips. Patience is a virtue with this recipe. I've tried to peel the peppers when they're not quite cool enough to touch, it's not worth it. Let them cool properly first and you'll find that you can peel them so much quicker. Just add all the ingredients to a small jug and stir until the honey has dissolved. Cut the peppers into slices and drizzle the balsamic vinaigrette over.